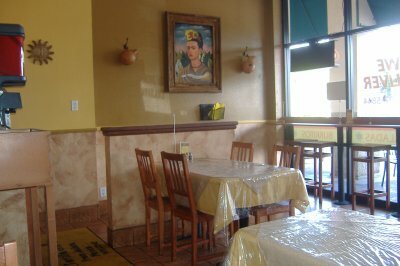 When running this blog I try to keep on top of things and be the master of the subject I've chosen to blog about but I find it's hard to even keep up with all the Mexican restaurant openings and closures. 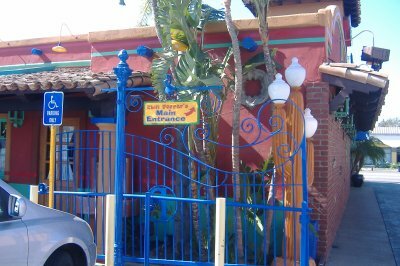 A few months ago I was in the old Placentia barrio off of Bradford and among many Mexican restaurants there I saw Tlaquepaque, which my friend James kept bugging me to go to, and made a mental note to try it sometime. 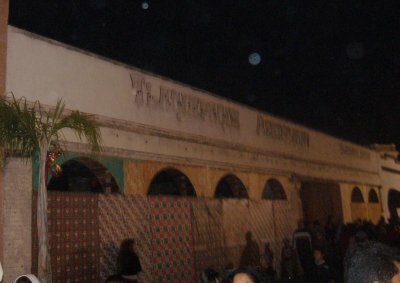 Well, when I was back in Placentia earlier this month for their Tamale Fest I saw that Tlaquepaque had closed down. Now I'll never be able to try it. If anyone knows why they closed down, or, perhaps, if they might re-open, please leave a comment. 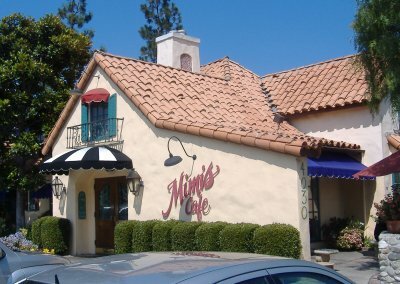 Or leave a comment if you have any memories of this restaurant. 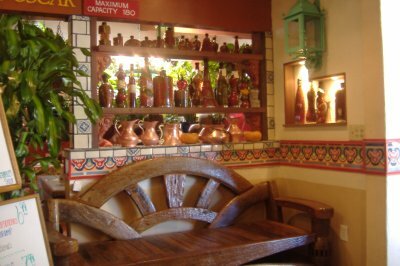 This post at Nancy Luna's Fast Food Maven blog says that Tlaquepaque is going to reopen. So, that's a bit of good news. Will update more as more info comes in. 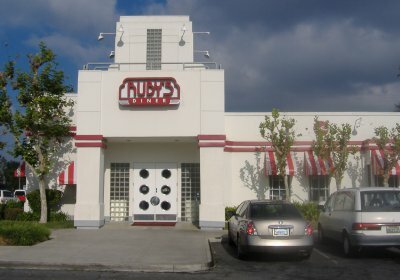 When you "Shooby-Dooby down to Ruby's" next be aware that the old-fashioned-style food chain has more than just hamburgers, shakes, and fries but also has a few Mexican items as well. 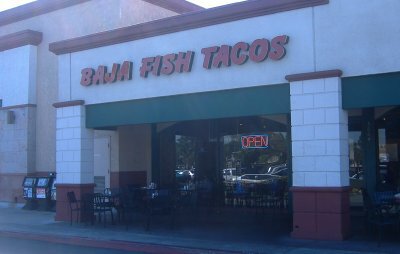 When I went to their Tustin location a couple weeks ago I tried their fish tacos. 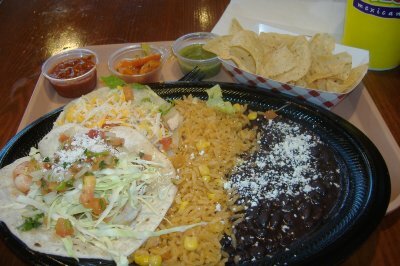 You can also get chicken, shrimp, veggie, or carnitas tacos, (The veggie tacos come on whole wheat tortillas and you can get a lo-carb version of the chicken soft tacos.) but you can't mix and match them. 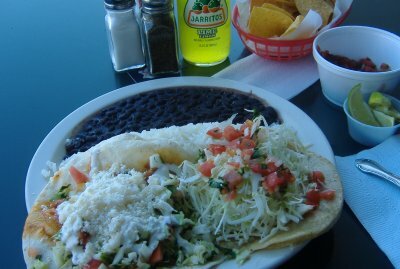 After ordering my tacos I wondered if I should've ordered a side dish to go with them but they were plenty filling. 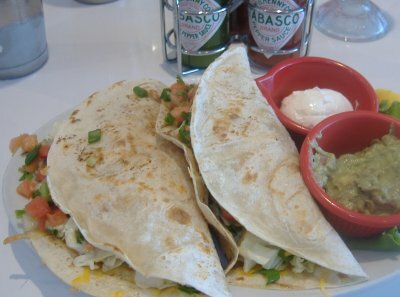 You get sour cream and guacamole on the side and a couple kinds of McIlhenny's Tabasco sauce to use to your liking. 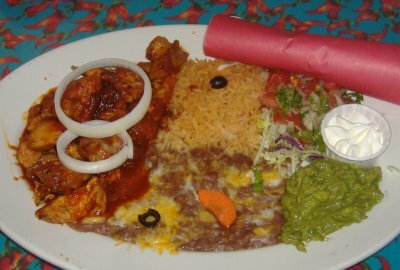 The fish had likely been frozen just prior to cooking but was flaky and flavorful enough to get me a good Mexican food fix at a non-Mexican place. 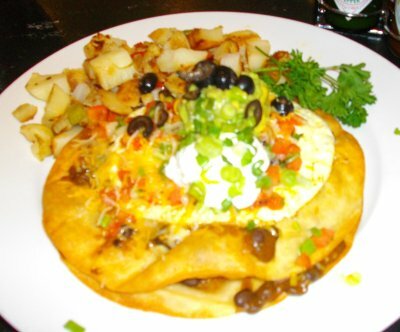 UPDATE: Here's a picture of when I got huevos rancheros at the Ruby's Moto-Diner at the Irvine Spectrum. Don't know why the picture turned out so bad. Today is the 3rd anniversary of the beginning of this website. 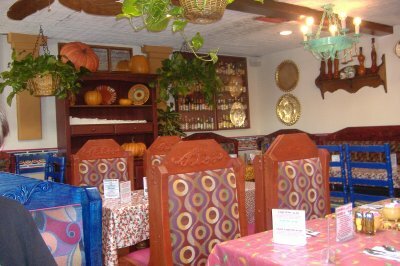 It started out as my own random, personal musings on Mexican food I've had and has grown until there are now more than 200 reviews. 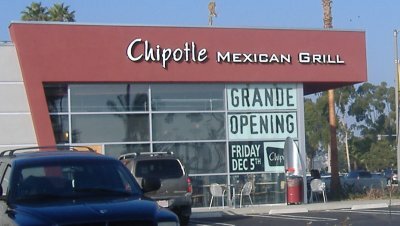 The site will continue to grow and cover more and more Mexican restaurants and food within the Orange County border (from taco trucks to upscale dining) and will be adding new features as well. At the moment I have at least six entries to finish up and post and there'll also be more guest reviews. 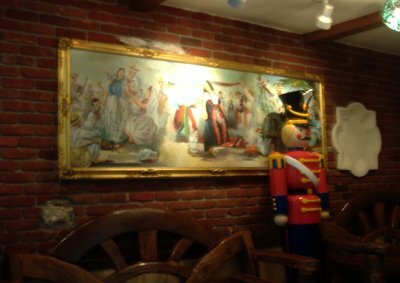 And if I really succeed at my "job" here I'll be able to arrange things so that new visitors will not be afraid to click around the site, do a little exploring, and find the information they need. Getting people to simply "click a link" has been a monumental task here. As always, feel free to leave comments with suggestions about what can be improved here. On another note, I've mentioned Frieda's produce here before but just found out that they have a new Garlic Delight product available at González Northgate Markets, Stater Bros., and Gelson's throughout Southern California. "Available in four varieties - Original, Chipotle, Sun Dried Tomato, and Green Olive, Garlic Delight is 100% preservative-free and made with simple, natural ingredients: canola oil, USA-grown fresh garlic, lemon juice and salt. It's also cholesterol-free, dairy-free and gluten-free and contains no trans fats." 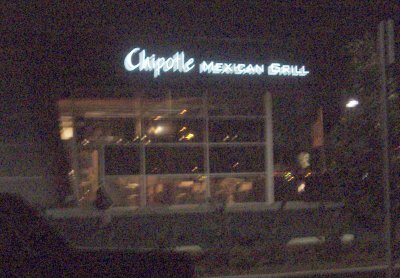 Obviously, the Chipotle variety would be of interest to those cooking up Mexican dishes. 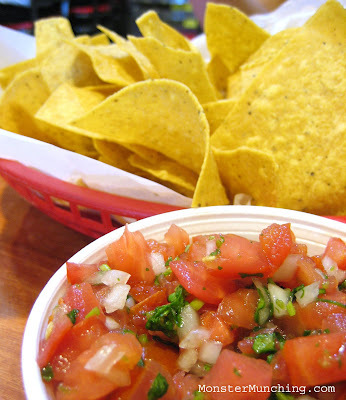 The pico de gallo should be saved for a nobler purpose: as the amigo to the hot chips. For $2.25, you get a basket of chips scooped from a heated receptacle by your cashier, and an empty Styrofoam bowl. The bowl is your license to go loco at the salsa bar. If you don't pay the premium, the salsa bar is free, but then you're relegated to those little thimbles they provide. And for the chips — they're the thin and homemade kind — you'll need as much as two heaping bowls. You'll savor every chunk of fresh tomato, every bit of spicy onion, and every fleck of cilantro, which may or may not get stuck in your teeth for hours of unintended embarrassment. Its gritty char, the velvet of the cheese and the acid tang of the enchilada sauce meld into something worthy of a telenovela — cheesy, sultry, and full of scene-stealing actors. 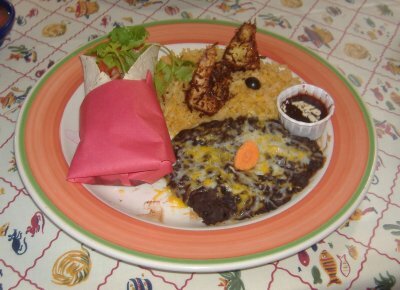 Flanking it on both sides, the rice and beans aren't just mere supporting players. The beans are so blubbery it's almost soup; but as soon as you rake it up with a fork, it seems to congeal at the cooling touch of the metal — a sign that lard is probably the secret ingredient. Then there's the rice. It's as fluffy as cotton, almost as flavorful as the rice they serve with Hainan chicken. Read Elmo's original review by clicking here. IMPORTANT NOTE: Complete Taco Bell coverage HERE. 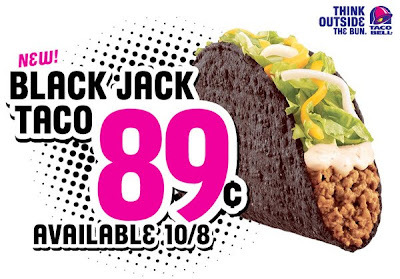 The new Black Jack Taco has a black shell, seasoned ground beef, and zesty pepperjack sauce. Click here for more info. 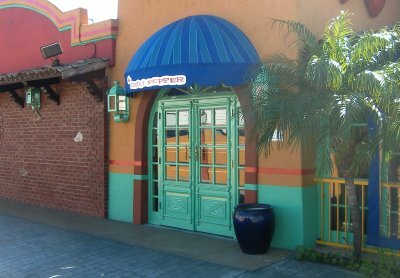 April 20, 2009: The test restaurant in Irvine on Barranca now has a Chili Fritos bowl and a Chili Fritos Burrito. Yes, it is Fritos brand corn chips that are inside each. 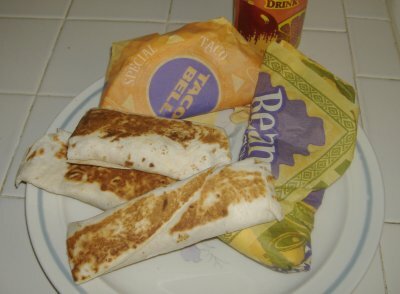 Taco Bell's new item as of January 2, 2009 is their Bacon Cheddar Gordita Crunch with lots of bacon, a soft taco shell, a crispy taco shell, ground beef, and melted cheese. This item even has its own website with ingredient listing and nutritional info and it cost me $2.49 for one. 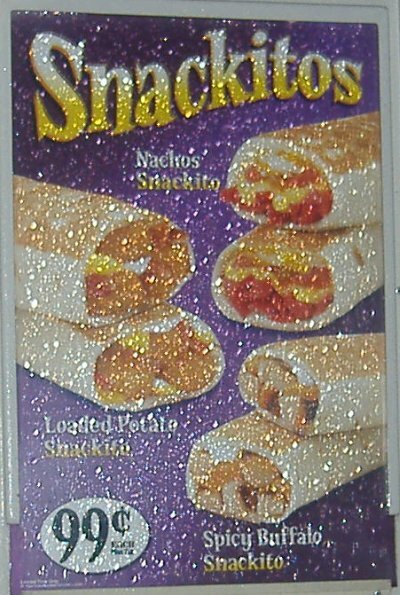 Just got back (Dec. 17, 2008) from a Taco Bell test restaurant and they had some new items called Snackitos. 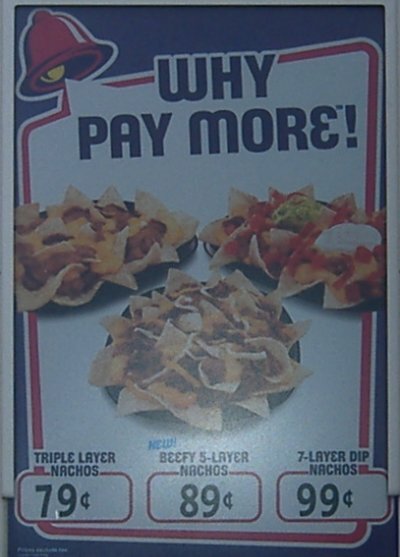 There are three kinds: Nachos, Loaded Potato, and Spicy Buffalo. Yes, this picture was taken in the rain. 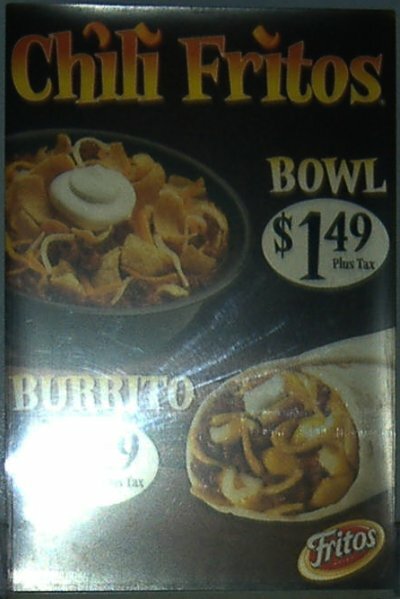 As of January 2, 2009 the Snackitos seem to have been removed from the menu. Went for lunch today (Nov. 17, 2008) to try out the new Taco Bell Fully Loaded Nachos that I've been seeing ads for but got sidetracked when I saw that there is now, at least at the test restaurant that happens to be near where I live, a new Fire-Grilled Chicken menu with a tortada (a word I've never heard before), a taco, and a burrito. I got the tortada and the taco. 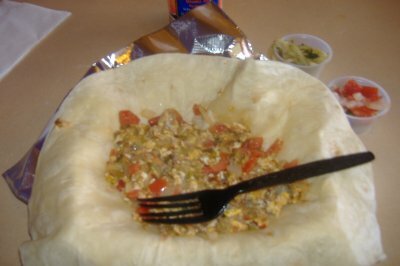 The tortada is kind of like a cross between a burrito and a tostada. 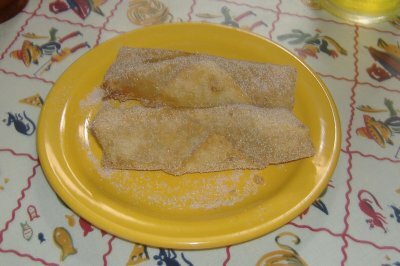 Both items I got had the same ingredients with the difference being that the tortada came in a bigger, toasted tortilla. 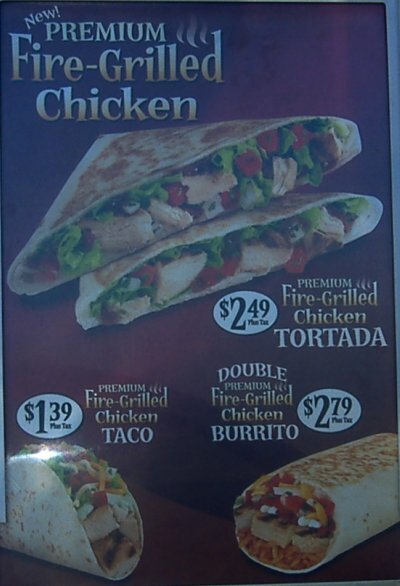 UPDATE (January 2, 2009): When I went back to this same Taco Bell location earlier today their fire-grilled chicken menu changed to just having three types of tacos. No more tortada or burrito apparently. 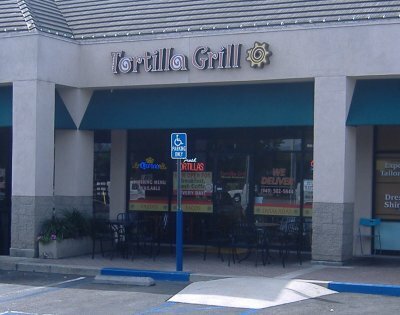 UPDATE (March 11, 2009): All of a sudden people have started doing a lot of searches for "taco bell tortada." I thought that Taco Bell had tested it and decided not to take it beyond test stores but now that everyone's searching for it I'm going to try to find out if it's been brought back. If anyone has any information on this please leave a comment. 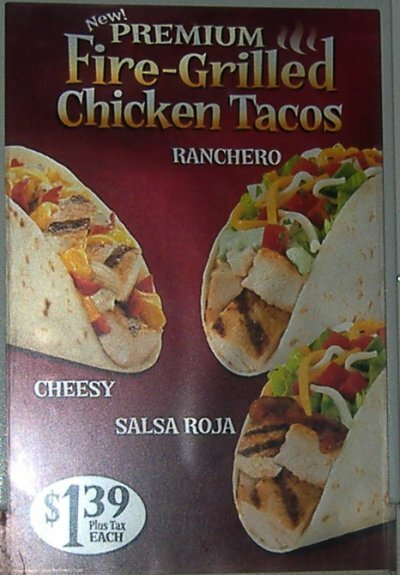 IMPORTANT NOTE (If you do not read this note you are likely to not find all the information you are looking for): This one entry is only one of our many entries on new items at Taco Bell. You can read our complete Taco Bell coverage all at once by CLICKING HERE. My site traffic tells me people do not see that link no matter how obvious I make it, which means that visitors here are not getting all the information they are looking for. Made a quick stop at the new-ish Fresca's Mexican Grill in Tustin (almost in Santa Ana) recently to follow up on the Fast Food Maven's recommendation to me to try their shrimp tacos. 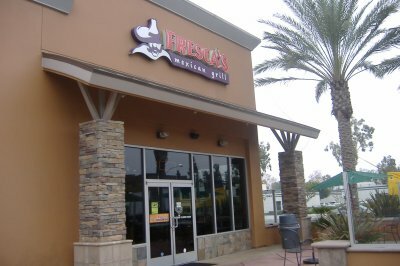 Fresca's is Orange County-based and similar to a lot of other fresh mex chains around here but it does have a few touches of authenticity you wouldn't expect. The thing I liked about the shrimp taco was that the shrimp were very fresh and plump and meaty with a hint of pineapple glaze and pineapple salsa. I wanted to get some flan but I've been trying to not have too much dessert lately. Time to let the pictures do the talking. This is one of those places I like a lot but just don't get to very much. 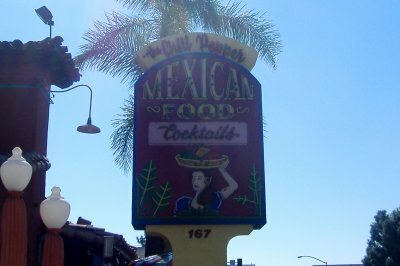 Here's a nice little place tucked away in the Newport Hills Shopping Center and I didn't even realize they had Mexican items on their menu until recently. 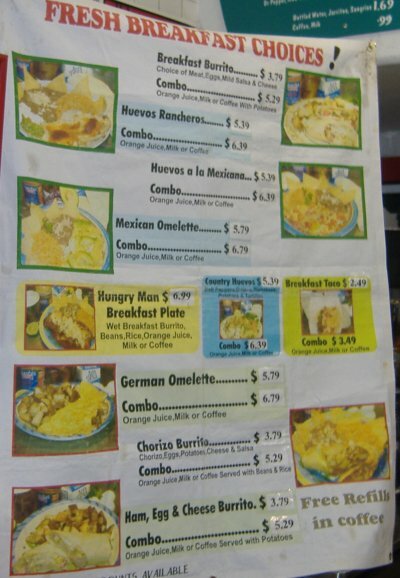 In fact they have a whole section of Mexican items for breakfast and another whole bunch for lunch or dinner. On Monday from the "PM Ole" menu I tried the Grilled Vegetable Quesadilla stuffed with "Pepperjack Cheese, Zucchini, Yellow Squash and Sweet Bell Peppers." 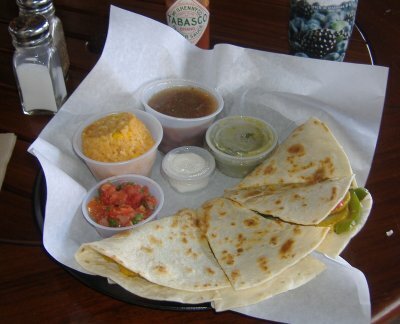 I liked that the quesadilla was not greasy on the outside, making it easy to pick up and eat. Good blend of flavors inside and the green tomatillo/avocado sauce helped. 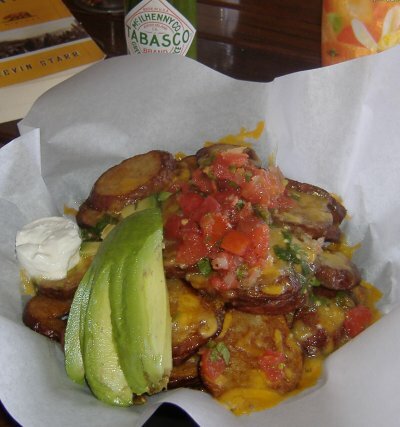 Early this morning I tried out the interesting sounding Breakfast Potato Nachos, made with "Red Rose Potatoes Smothered in Cheddar Cheese, Pico de Gallo, Avocado and Sour Cream." 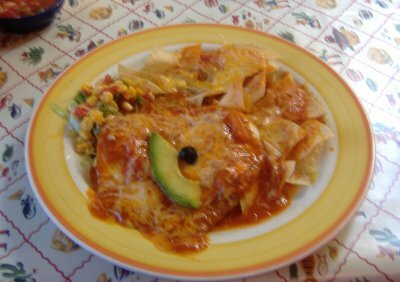 This is the first time I've ever heard of breakfast nachos so when I find something unusual like this I have to try it out. This really is nachos with fried up potato slices in place of corn chips. Overall I enjoyed it but wish they could've followed the quesadilla's lead and made the potatos a little less greasy. Both entrees were $7.95 and the Sunkist protein drink thing I got each time was $3.85. 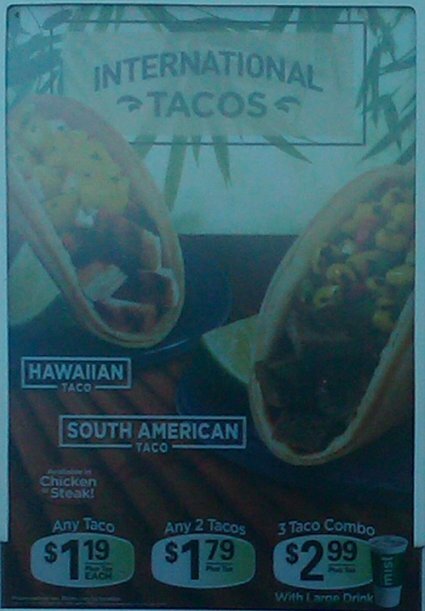 Slightly pricy, but when the opportunity presents itself I'll be trying more of Pacific Whey's Mexican items. 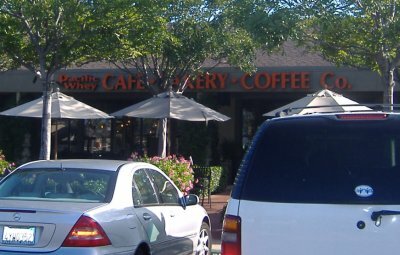 And they have lots of good bakery items too that I've tried before. 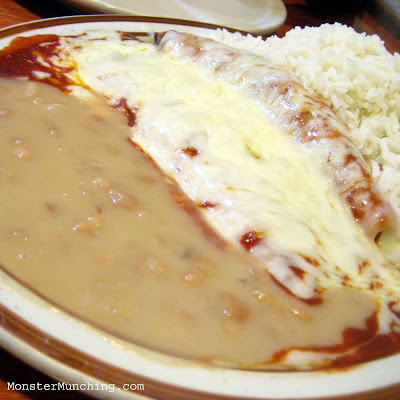 Before I write more about Mexican food I need to put the brakes on and find out if any readers have any thoughts on how this blog could be run better, better organized, etc. The reason I ask is because the site traffic suggests that the vast majority of visitors to this site do not click around the site to find the information they need and 95% of the time that information is only one click away . . . and usually the necessary link is staring the visitor in the face. Believe it or not the almighty Google does not always send people to the best page on the site for the info they are looking for and I find that usually a visitor will glance at the first thing they see here, assume wrongly the site doesn't have what they are looking for, then leave. This really is a pandemic, oft-repeated scenario. I wouldn't bother mentioning it if it hadn't happened thousands upon thousands of times. Is there something I can do to make the links more obvious? ... or have people been conditioned by Google to be afraid to explore a website? Trust me, it looks a lot better than that in person. I'll try to get some better pictures soon (unless an enterprising reader wants to beat me to it and submit some) and might even get there on opening day. The location is on Beach Blvd., I think between Heil and Edinger on the west side of the street. 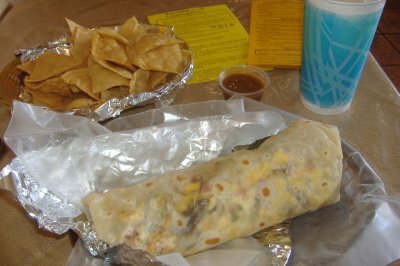 And do me a favor, when you go there and you want a Barbacoa Burrito please don't ask for a Barracuda Burrito. 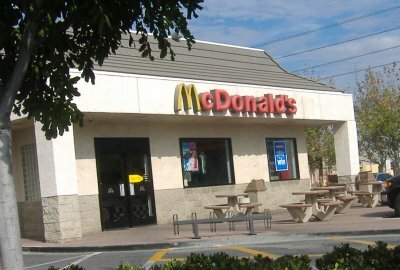 More information can be found at the Fast Food Maven blog. No surprise to longtime readers but I am always analyzing the traffic for this site in many different ways. 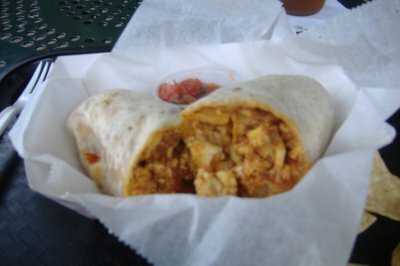 What has surprised me is how often people search for information on the "best breakfast burritos in irvine," with similar searches for other OC cities rarely turning up at all. Why would that one city be the most popular one out of all Orange County? I still don't know the answer but if anybody has any insight let me know. 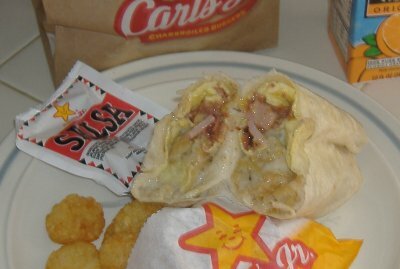 I'm not even much of a burrito guy but recently set out to try all the breakfast burritos in Irvine I could. My quest may never end (as with the overall quest of this entire blog) but I'll update this entry every time I try a new contestant. 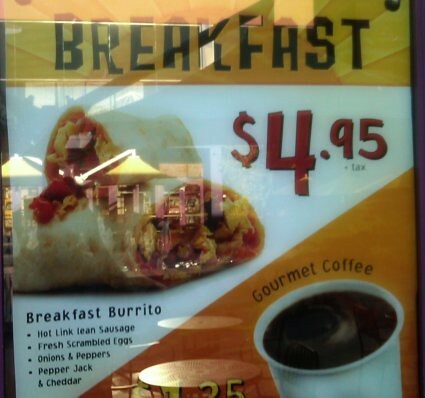 And let me just say that I don't care where the breakfast burrito comes from. 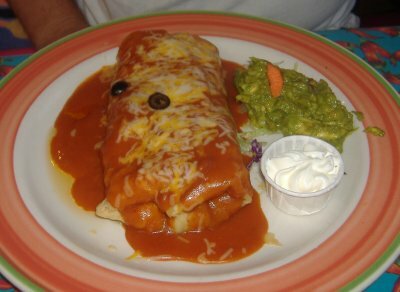 It doesn't have to come from a "Mexican" restaurant per se; it can come from any place that sells food and also happens to have breakfast burritos on the menu. 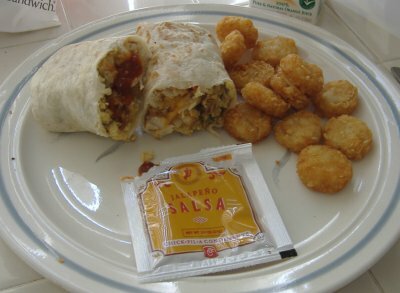 So here's pictures (and possibly descriptions and comments) of the burritos I have come across so far. 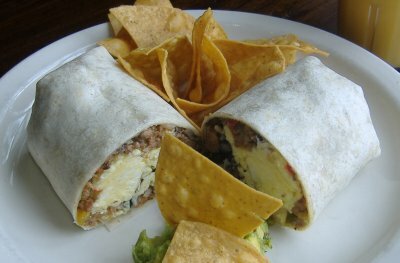 "Stuffed with scrambled eggs, shredded beef, green onions, cilantro and black beans. Topped with chipotle sauce and melted cheeses. Served with red skin potatoes." 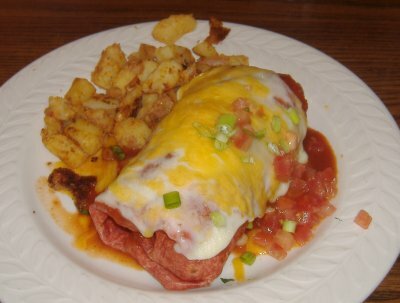 I can't remember what this breakfast burrito was called. 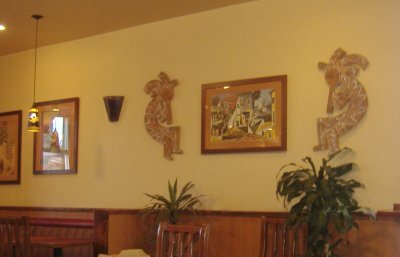 Las Fajitas has three or four to choose from but they no longer have an official website because, as they told me, nobody ever looked at it. 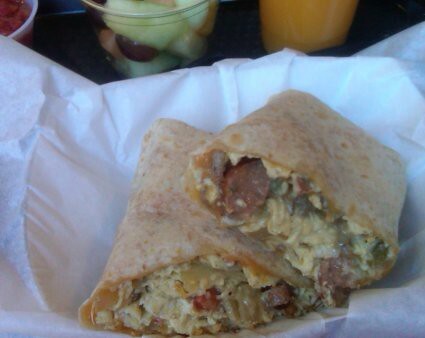 "Organic scrambled eggs, Niman Ranch sausage mixed with peppers, onions, garlic and choice of rice or pinto beans." 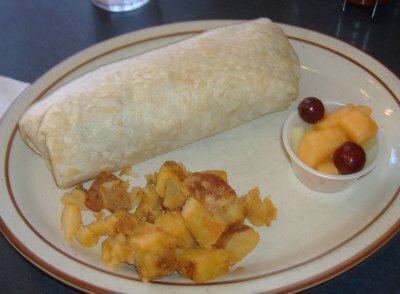 I already wrote about this burrito in an entry on the breakfast at the La Sirena Grill in Irvine. 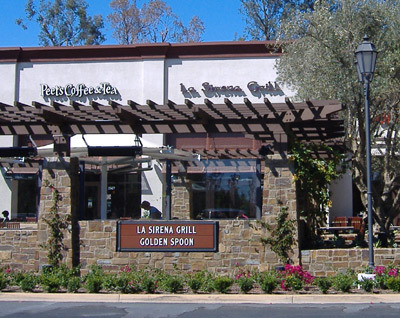 It can be read by clicking on the 'la sirena grill' label at the end of this entry. My comments: More rustic than you would think coming from McDonald's. 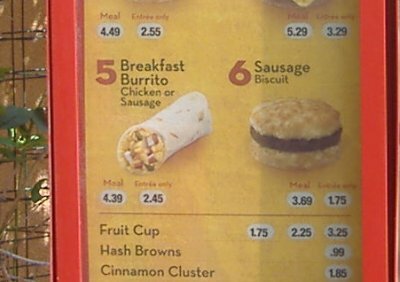 My comments: nobody remembers that Taco Bell used to have a Country Breakfast Burrito with gravy in it. 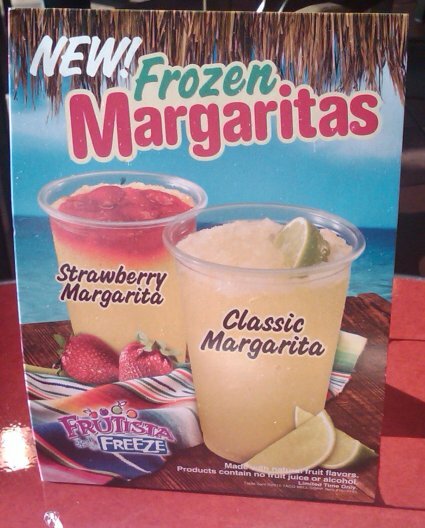 Now Taco Bell doesn't but Carl's does. 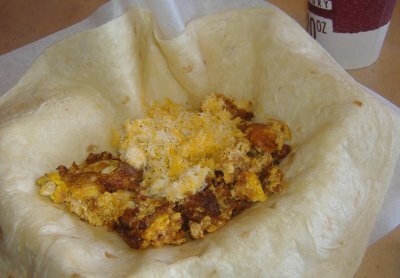 "4 eggs scrambled with shredded beef and pico de gallo stuffed in a handmade flour tortilla with jack/cheddar cheese and beans." My comments: This burrito was huge. 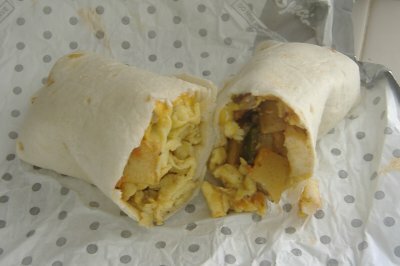 My comments: This was an okay breakfast burrito. 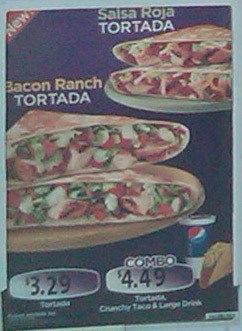 The interesting thing about it is that they serve it to you open-faced then you can roll it up yourself. "Jalapeño hot link chopped with freshly scrambled eggs, grilled onions & peppers, with cheddar and pepper jack cheese. 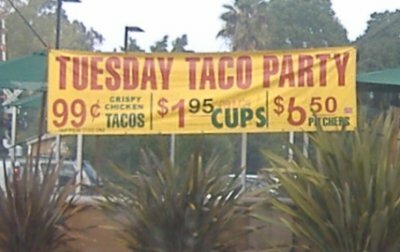 Served with a side of fresh salsa."